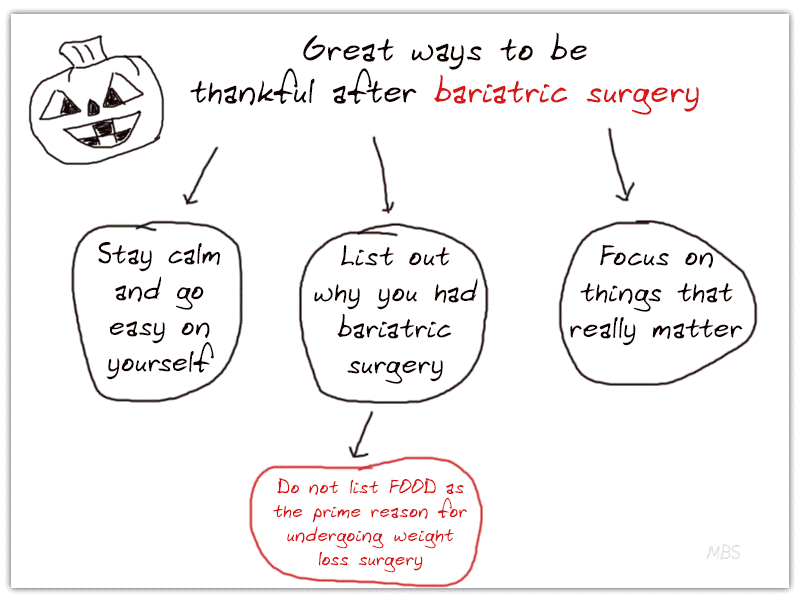 Here are some ways to overcome Thanksgiving challenges that individuals who’ve had gastric sleeve, bypass or any other bariatric surgery may face. According to her the key to success after bariatric surgery is eating in moderation following the dime technique. Hey, everybody! I wanted to do a post today about Thanksgiving and the challenges that can go with that, this time of the year. Anytime you have a major holiday that basically revolves completely around it, it can be very difficult, especially as a weight loss surgery patient and especially, if you are recently out of the surgery or if this is your first year since having surgery for this holiday, it can be a completely unchartered territory. So, whether it is family, friends, job, health, work, having house, whatever it is to keep you focused and centered on things that really do matter. It sounds corny, but that can be really important as you go in the stay and go whatever gatherings that you may have on Thanksgiving and around this weekend as well. If you are six months or last from surgery especially, try to focus on having that turkey first,going for dark piece of turkey, the dark meat over the light. We think of light as being healthier usually and lower in fat which is but the dark meat is usually a little bit more tolerated. So, that could be a good one especially if you are post-op for less than six months or so. 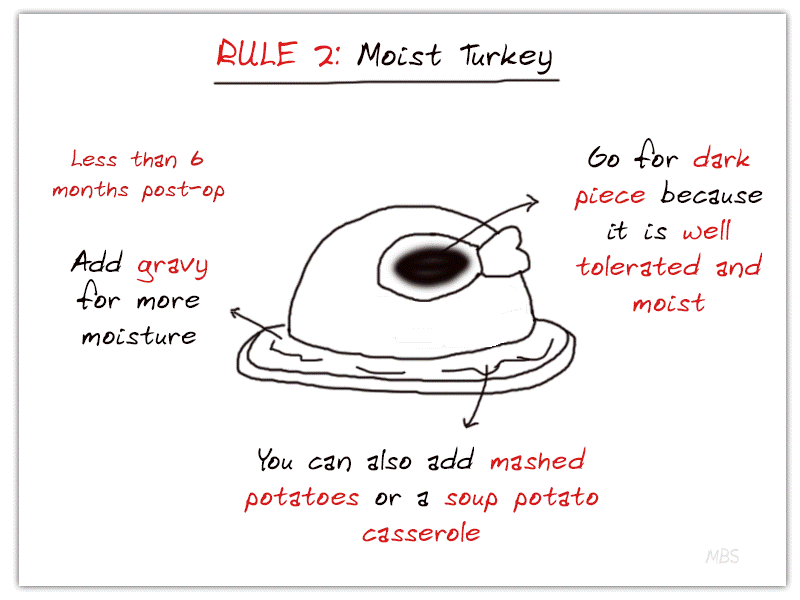 It is more moist and is little bit better tolerated. You can add a little bit gravy to that again for the moisture or mixing it maybe with some mashed potatoes or a soup potato casserole, just to kind of add that moisture. 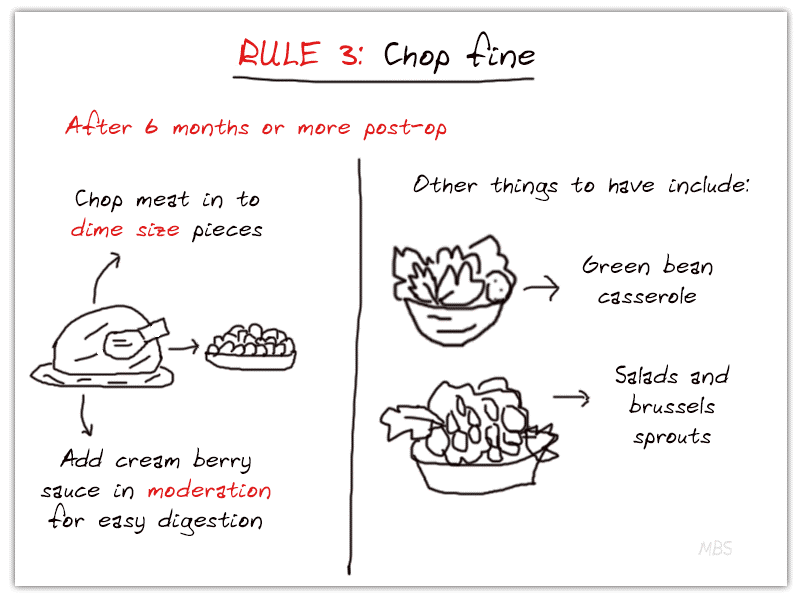 Remember to chop things especially the meat in tobite size pieces, dime size or half teaspoon size as your bariatric surgery guideline. Again, you could also add, maybe cream berry sauce to this. Just be careful if there is a lot of relish in it because that can be difficult for some people to tolerate. 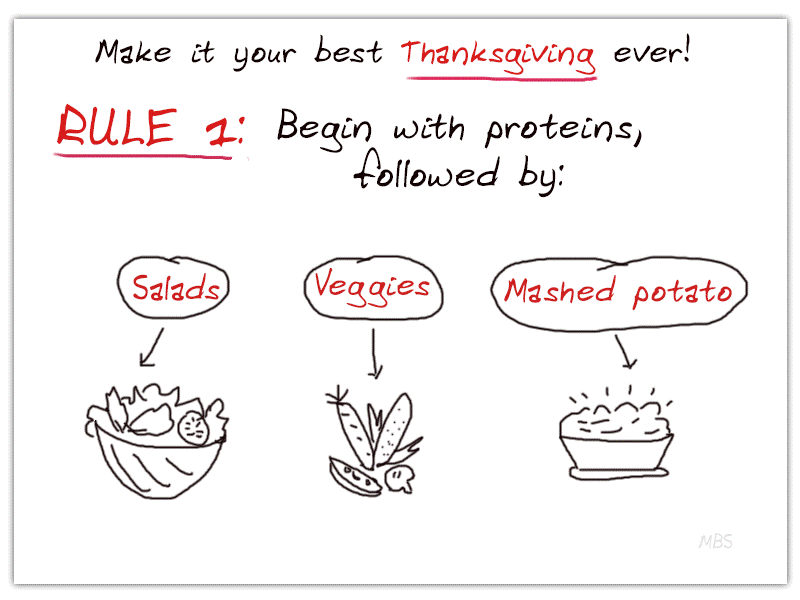 So, other things are good, your mashed potatoes, your traditional green bean casserole is always good. If you are six months or more off from surgery, a lot of salads are nice to have, even some Brussels sprouts can be good for people. Again, having those lists of why you wanted surgery and what you are grateful for that do not revolve around food to help keep you focused. Whether you are six months or more in to bariatric surgery, the key is to stay calm and making correct eating choices for a healthier you. Here is another video of our bariatric nutritionist discussing nausea after bariatric surgery.